Some roads are beautiful, some roads are exquisite Roads in India which are as deadly as beautiful, but there are some roads that are extremely stunning and perilous at the same time. We have compiled a list of roads that are as treacherous and as beautiful as they seem. Spread across the Himalayas, Pir Panjal and Zanskar Ranges these roads are some of the most dangerous routes to drive on. These roads are perfect for thrill seekers and adventure lovers a like. the most difficult paths to traverse. The Zojila Pass, situated high in the mountains of Kashmir is the most vital link between the Ladakh and Kashmir valleys. The road leading to the pass winds along almost vertical cliffs which makes driving an enthralling and precarious experience. One slip up along the road and it would end up in complete disaster. There is no denying the fact that the road leading to Zojila Pass is beautiful and awe-inspiring, but also extremely terrifying and petrifying. Kinnaur Road is a charming cliff-hanging drive along the ostensibly bottomless gorge created by the Baspa river gorge in Sangla Valley in Kinnaur district of Himachal Pradesh. The road is quite narrow and in many places it has been carved out of the crag, leaving overhangs enclosing the road. The road connects Kinnaur valley with the rest of the country. This spectacular man-made marvel is one of the most beautiful and dangerous roads, not only in India, but also the world. As one climbs higher up beyond the hills of Manali, an intimidating road is met. This road leads to the Rothang Pass, which connects the Kullu valley with the Lahaul and Spiti valleys. Though the pass is not very high or difficult to cross, it has a reputation for being dangerous as the region is frequently hit by bizzards and relentless snow storms. Once the highest motor-able road in the world Khardungla Pass stands at a staggering height of 18,380 feet and the majestic mountain pass boast a meandering narrow snow covered road. The road is located in the district of Ladakh in Jammu & Kashmir and remains covered in snow almost all year round. The raod connects the Nubra Valley and Siachen Glacier with Ladakh. The road and snow have a relationship like a river and a gorge, with steep man-made cliffs of snow on the two sides of the road. This picturesque road is slippery almost all the way, and vehicles have to ply at tortoise-speeds to avoid falling off the sides or having wheel spins. Chandrataal also known as “Moon Lake” is connected by a road which hardly has any tarmac on it, this soul crushing route has some of the most immaculate natural sceneries all along. The road which connects Chandrataal to Kunzum gets tricky to traverse as many natural streams cut through the road which makes driving easier said than done. The road poses a colossal challenge but the natural beauty of the Laul Spiti valley is worth all the risks that comes along with the road. This beautiful road between Killar and Kishwar, is a narrow road along the cliff. The road follows the Chandrabhaga river which flows in a deep and narrow gorge all the way from Pangi Valley to Kishtwar. Driving on this road is an experience of a lifetime with natural rock hangings and steep cliffs on either sides of the road. The route is pristine and intimidating at the same time. Chang La Pass is on the route to Pangong Lake from Leh. The name means “Pass towards the South” or “Pass in the South”. The Changla Pass is the main gateway for the Changthang Plateau situated in the Himalayas. The road leading to Chang La Pass is one of the highest motorable roads in the world standing at a staggering height of 17664 feet, standing behind Mana pass and Khardungla Pass. The stretch of 10 km on either side of the road to Chang La Pass is loose dirt and sludge, and during the Monsoon months many streams appear on the across the road, which make driving a monumental challenge. The village of Lachung is one of the most picturesque villages in Sikkim. Situated in the North district of the state the village is connected by a narrow road which is blanketed by snow most of the year. This road connects Lachung with Mangan the district head quarters. Driving on snow can be a beautiful experience but there are several risks involved. The word Lachung literally translates to ‘small pass’ and this beautiful road can be very deceptive especially in the monsoon season. Perched at the border between India and Tibet (China) the Nathula Pass is an incredible road maintained by the Indian Army. 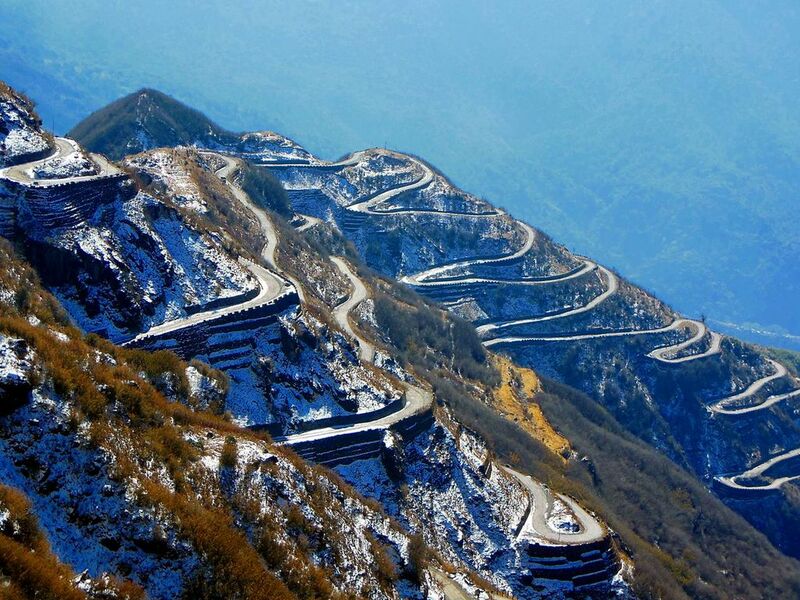 The winding hair-pin bends and snow over the road, makes it one of the most difficult roads to drive on. Vehicles cannot move faster than speeds ranging between 5 and 15 km per hour. The Nathula pass has been the soul of the Silk Route since the beginning of Indo-Tibetan trade. The route connects Nathula Pass with the capital of the state Gangtok. Zuluk is a small village situated along the winding road and countless hairpin bends. The intimidating road was the original historic Silk Route which was used by the traders to exchange goods between Tibet and India. The road as such poses no real threat but driving along the continuous curves and bends can prove to be excruciating for the drivers as well as the passengers who tend to get car sick. During August and September, Zuluk is soaked in a frenzy of colours emanated by wild flowers. From January to April Zuluk is covered in snow. The rainy season of May to July is usually foggy but the rest of the year it has sparkling weather. There are many other roads that parallel the peril and beauty of the roads mentioned in this list. We hope you had a fun time reading about these routes and are already gearing up for your next adventure on at least one of the roads. Do let us know what you think about the list, and any other road that you think is as deadly and as beautiful as the ones in the list in the comment section below.